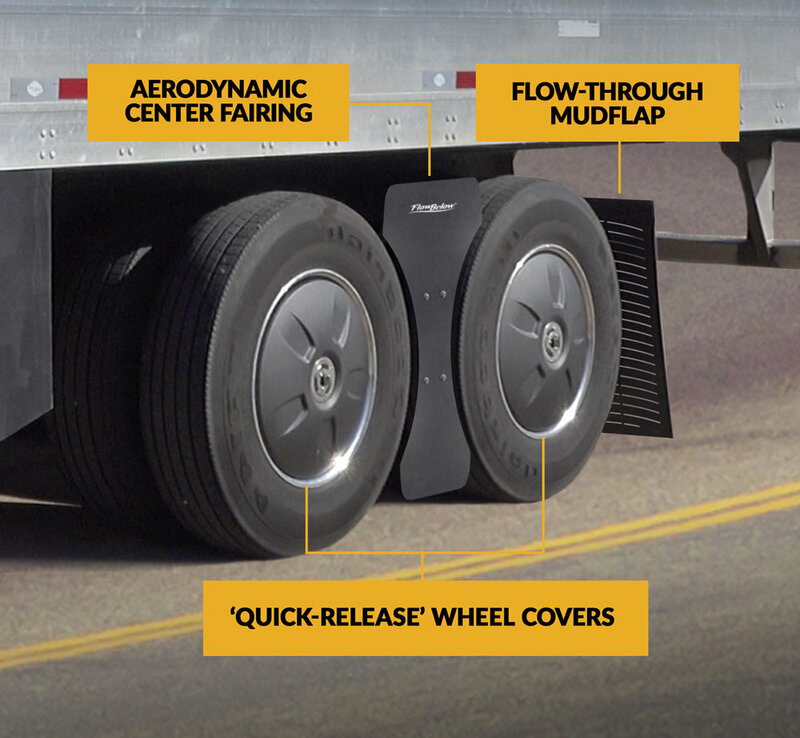 The FlowBelow Trailer AeroSlider System includes a center fairing, quick-release aerodynamic wheel covers and aerodynamic mudflaps installed on the bogie slider to reduce turbulence and drag around the wheels which improves fuel efficiency. Reduced turbulence around trailer wheels lead to reduced fuel consumption. Achieve maximum fuel efficiency from your fleet with the FlowBelow Trailer AeroSlider System. Each kit includes: 2 tandem aerodynamic fairings, 2 flow-through aerodynamic mudflaps, 4 quick-release wheel covers, which provide instantaneous access to the wheel end via FlowBelow's patented "push and turn" quick-release latching system. How durable is the Trailer AeroSlider System? The Trailer AeroSlider System was designed alongside major fleet partners and is made to standards specified by large fleet mechanics and drivers. The tandem fairings, mudflaps and wheel covers are made from 100% rust proof polyethylene and are engineered to maintain maximum durability even in known extreme weather conditions and temperatures. Does the Trailer AeroSlider System work with trailer skirts and boat tails? The Trailer AeroSlider System improves fuel efficiency with or without additional trailer aerodynamic devices such as side skirts and boat tails. Because the Trailer AeroSlider System addresses the drag intensive area around the wheels of the trailer, it is effective no matter what type of trailer you pull. Is the Trailer AeroSlider System compatible with my existing wheels and tires? The FlowBelow Trailer AeroSlider System works with most wheel and tire configurations, including super singles. The wheel covers utilize FlowBelow’s patented quick release system to provide drivers and maintenance staff with instant, tool-free access to the wheels. Just push and turn the wheel cover to remove it in seconds. To re-install, simply place the wheel cover over the wheel and turn until the quick release clicks, letting you know that is is securely fastened. Can I use tire chains with the Trailer AeroSlider System? Absolutely. The wheel covers only interact with the wheel hub and provide plenty of access to install and remove your tire chains in winter conditions.